Please notify your server of any food allergies or special dietary needs. We fill a deep dish pastry shell with a variety of wonderful fillings and cheeses. See the blackboard for today's favorite Quiche. Served with fresh fruit and skillet potatoes. Two crepes filled with a variety of sweet fillings - check the blackboard for today's creation. 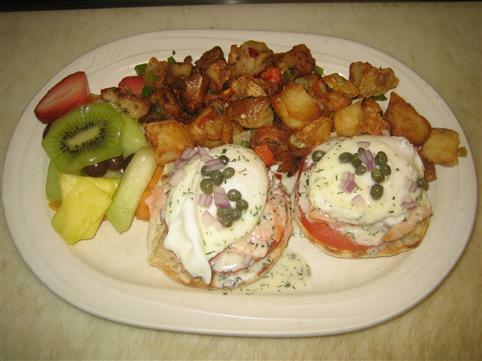 Served with two scrambled eggs, fresh fruit and skillet potatoes. Build a three egg omelet from any three ingredients at no extra charge. Additional items are $1.00 each. Served with skillet potatoes, fresh fruit and toast. TOPPINGS: Smoked Bacon, Sautéed Mushrooms, Yellow Onion, Green Onion, Fresh Spinach, Ham, Sausage, Green Chile, Red Peppers, Green Bell Peppers, Tomatoes, Swiss Cheese, Cheddar Cheese or Mozzarella Cheese. Served with scrambled eggs... choose one of these buttery croissants with your favorite fillings. 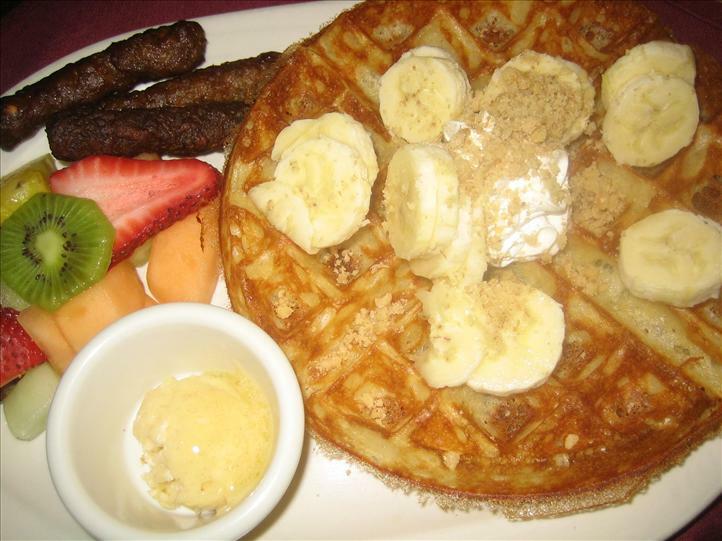 Served with fresh fruit and skillet potatoes. Two poached eggs cooked to order served on a toasted English muffin with Canadian bacon and Hollandaise Sauce. Served with fresh fruit and skillet potatoes. Two poached eggs cooked to order, served on a toasted English muffin with our Housemade Crab Cake and Hollandaise Sauce. Served with fresh fruit and skillet potatoes. 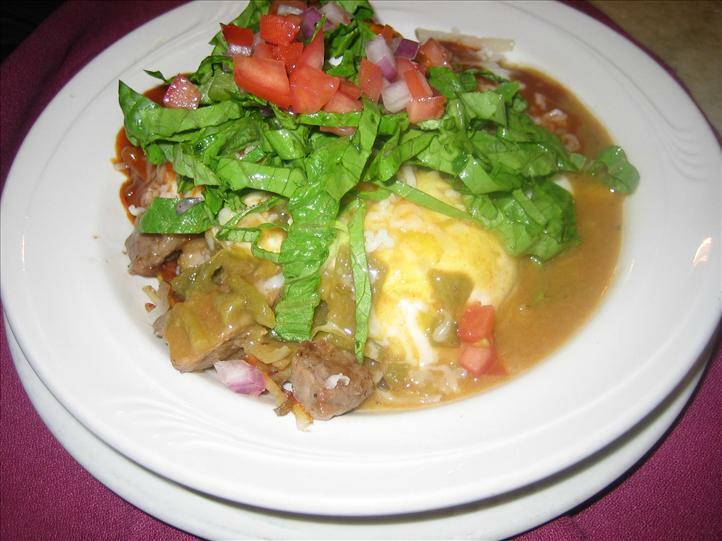 A southwestern version of the Just Benie with two poached eggs cooked to order but smothered in red or green chile sauce. Served with pinto beans and skillet potatoes. Two poached eggs cooked to order with fresh spinach, avocado and tomato, then topped with Hollandaise Sauce. 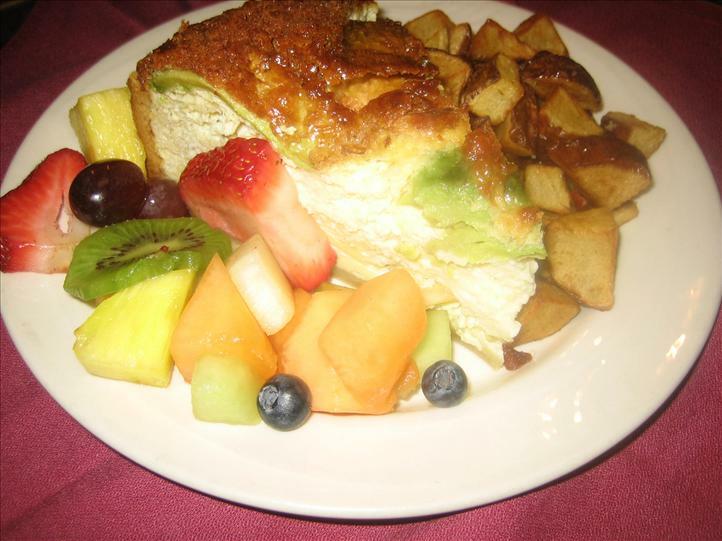 Served with fresh fruit and skillet potatoes. Two large slices of French bread stuffed with homemade chunky applesauce, dipped in egg batter and rolled in a walnut-cinnamon mixture and toasted to a rich golden brown. Served with fresh fruit. Egg battered French toast, fresh strawberries, whipped cream and strawberry sauce. Served with fresh fruit and choice of smoked bacon, sausage links or Canadian bacon. Two thick slices of French bread dipped in egg batter and toasted to a golden brown. Served with a choice of smoked bacon, sausage links or Canadian bacon. Served with fresh fruit. Homemade waffle batter rises overnight to create a crispy Belgian style waffle. See our blackboard for today's waffle creation. 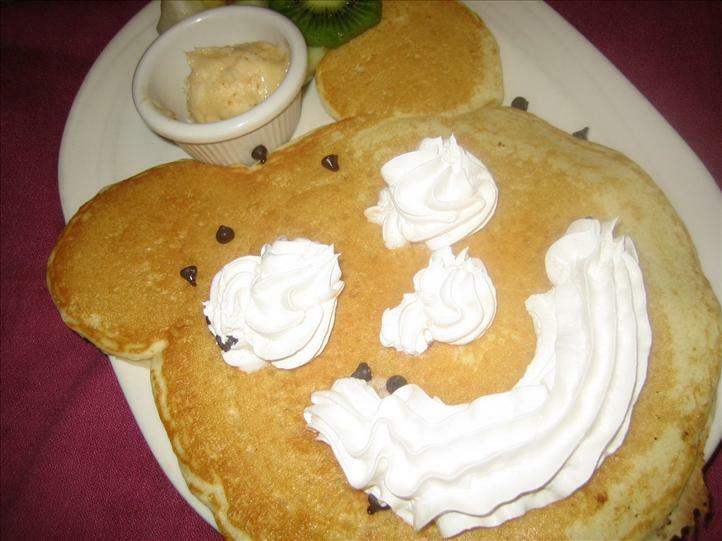 Served with cinnamon-honey butter and hot maple syrup or our specially made bourbon-vanilla syrup. Belgian waffle with caramelized sugar and cinnamon. Served with fresh fruit. Homemade Buttermilk Pancakes cooked to a golden brown and served with fresh fruit and a choice of smoked bacon, sausage links or Canadian bacon, and served with cinnamon-honey butter, hot maple syrup & our specially made bourbon-vanilla syrup. We take crisp hash browns, prime rib, choice of two eggs, smothered in red and/or green chile sauce and top it all off with white cheddar cheese. A warm flour tortilla will ensure you get to scrape the bowl before all is said and done. Start with two blue corn tortillas, smothered with red and/or green chile sauce and melted white cheddar cheese, topped with two eggs cooked to order. Served with pinto beans, lettuce, tomato and warmed flour tortilla. We stuff a large Hatch Chile with white cheddar cheese, corn and spices then dip in beer batter and deep fry to a golden brown. Two eggs any style smothered with red and/or green chile sauce. 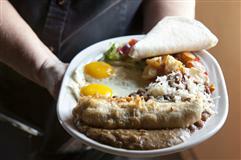 Served with pinto beans, lettuce, tomato and a warmed flour tortilla to help cool things down! A large flour tortilla is filled with chopped smoked bacon, hash browns, white cheddar cheese and two eggs cooked to order then smothered in red and/or green chile sauce. Served with pinto beans, lettuce, tomato and a warmed flour tortilla. Half of a Belgian Waffle is topped with vanilla ice cream and served with warm maple syrup. Creatively designed buttermilk pancakes, topped with chocolate and whipped cream. A single slice of French toast with cinnamon-honey butter and hot maple syrup. 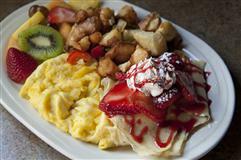 Choice of one egg, hash browns or skillet potatoes, choice of bacon, sausage or Canadian bacon and one slice of toast.